Having the grooves installed facing upwards has the potential to reduce the lifespan of your decking. There is a long-standing and surprisingly fiery debate on about whether the grooves (or reeds, as they're called) on a decking board are intended to be placed face up or face down. Internet commenters have waged intense campaigns supporting one side or the other and decking installers can be found sitting in both camps. The answer, though is quite a simple one; boards should unequivocally be placed grooves down. 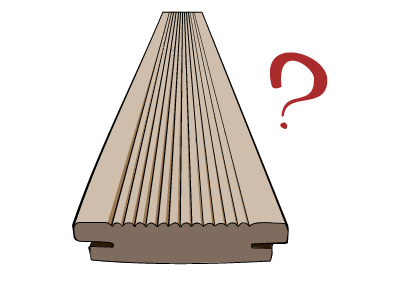 What are decking grooves for? The grooves or reeds on a decking board are not there as an anti-slip measure, nor are they there to make your decking look prettier. They are designed to allow for airflow underneath the boards to stop moisture and mould build up. In fact, many board manufacturers' warranties are voided if the boards have been installed with the groove side facing upwards, as this can seriously jeopardise the longevity of the boards. If your installer has put them in incorrectly, then you have grounds to ask them to redo the job the right way (unless this is what you asked them to do, of course). The one exception to this rule may be laying them groove side up on a ramp required for wheelchair access, as the rubber tires will have more traction on a grooved surface. If you really need to have an anti-slip coating on the boards, there are various sealants available for use to texturise the wood or rubberise it, giving extra traction and stability. Alternatively, rubber matting is available that can accomplish the same task while being portable, allowing you to remove it when it's not needed so as to protect the look of the boards. Likewise, textured adhesive strips can also be used to give some more grip.